Last week, in my week 7 recap, I showed how my 14 mile long run, despite getting very little sleep due to the blackout, went very well. I held a good pace, I weathered the conditions well and felt strong at the end. This week, on the other hand…things did not go well. I got plenty of sleep. I fueled and hydrated well and according to the plan. We woke up plenty early to avoid the coming heat (high of 100, heat index of 110). And yet, despite of all this, my run went horribly. How bad? Just take a look at my splits. The first thing you may notice is that I only went 14 miles, despite the plan being for 15. The second thing you’ll notice is how the wheels completely fell off after 9 miles. By that time in the morning, the temperature had climbed into the 80s with a heat index nearing 100. I decided I would take some walk breaks to keep things under control. Those walk breaks became longer and longer. Once I hit mile 13, it was all walking. I tried to start running again, but it wasn’t happening. I ended up walking the last mile and a half before I called it quits and went home. I was defeated and beaten down. It’s amazing, really. The same distance, one week apart. 2:28 vs. 2:52. 24 minutes over 14 miles. It’s like two different people ran it! Tuesday. Due to running on Saturday and Sunday last week, I took Monday completely off and spun on my bike for a bit on Tuesday afternoon. My legs were feeling back to normal, which was nice. The heat was already starting to hit, and I knew it would just get worse over the week. Thursday. 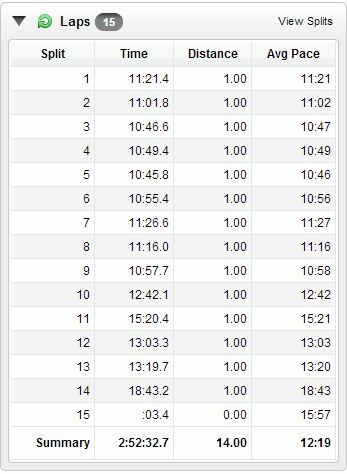 3×1 mile after warm up, plus a cold down. I know the intent of repeats is to run them at the same pace, or get slightly faster over time. Me, however, decided to go full out during the first mile and screw up the rest. 7:01, 7:28, 8:23. Oops. Saturday. The death march. 14 total miles, broken into 9 somewhat decent ones and 5 mostly walking. Terrible. This entry was posted in Uncategorized by JB. Bookmark the permalink.